Mannie Gentile: Toy Soldiers Forever: The price of cheap toy soldiers. Of course, it is not just China that abuses and profiteers in this way. 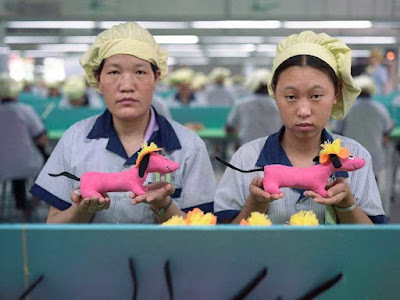 The Western Corporations transferred their manufacturing arms to East Asian countries in order to profit by the lack of worker protections (not that they were ever especially strong in the US, and in the UK and New Zealand (among others) they have been seriously eroded). It just goes to show that China can scarcely be called 'Communist', these days, eh? Not with a straight face anyhow! The 'Dictatorship of the Proletariat' has a whole new - inverted - meaning. Something we need to be aware of when we consider buying cheap plastic toys. When I took the family to Disneyland in Florida years ago I was horrified to find even Mickey Mouse had 'Made in China' on his bum! Personally, I only buy metal wargame figures (as I use 10mm Napoleonics) from a reputable UK manufacturer and use a British painting service, so my wargaming budget is supporting British companies and not employers who exploit their workers in this way.